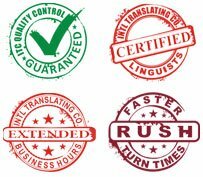 Manufacturers that hope to remain competitive must rely on the support of accurate and fast translation services. This allows you to adapt to the changing global economy and look at global markets, as well as local markets, for opportunities to expand sales and generate increased revenue. User manuals and regulatory documentation will need to be translated into other languages to reach new potential consumers.